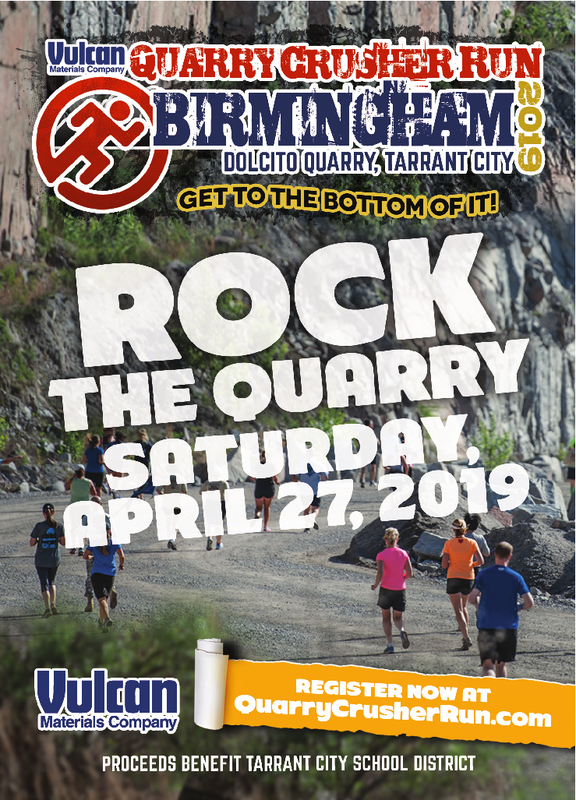 08 March 2019, Birmingham, AL—Offering up-close views inside a working quarry and a running challenge like no other, Vulcan Materials Company hosts the 4th annual Quarry Crusher Run—April 27, 8:00a.m.—at its Dolcito quarry near Tarrant City. The race starts in the middle of the quarry, goes to the top, then all the way down past rock cliffs to the bottom before bringing you back to the finish line. Runners experience a 700 foot elevation change on an average grade incline of 10-percent. Participants have two distance options: the 4 mile Quarry Crusher Run and the 8 mile Double Crusher. Registration is available online at www.quarrycrusherrun.com. Race prices range from $40 to $50 and include official t-shirt and finisher’s medal. Discounts are available for military, first responders, teachers, students and teams. Prizes are awarded to overall winners and age group placers. The Quarry Crusher Run is now held at nine Vulcan Materials locations across the country. Runners who participate in multiple races get discounts and can earn exclusive Rock the Quarry series medals. Every Quarry Crusher race has a community partner, with Vulcan Materials donating race proceeds to these local organizations. Quarry Crusher Run Birmingham benefits Tarrant City Schools.